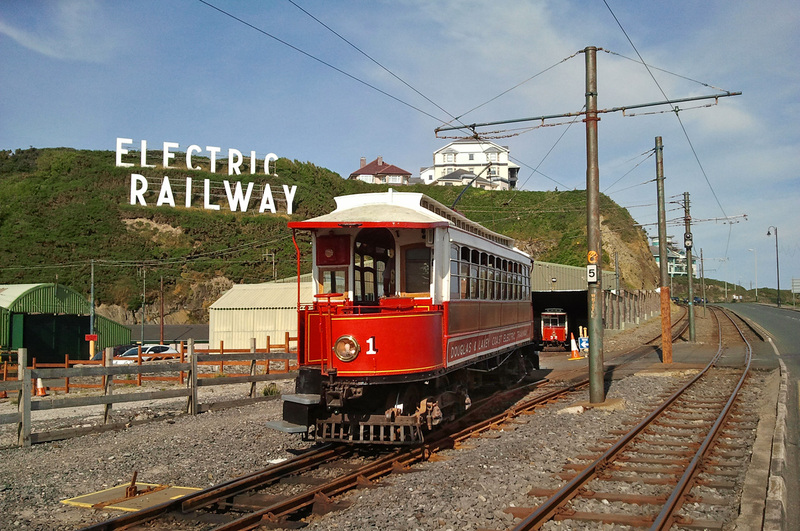 This island in the Irish Sea is a superb timewarp.The Trams here date from the 19th century and all the original rolling stock is still in use.No palisade fencing,no yellow jackets and no ridiculous signage anywhere.A truly iconic place. 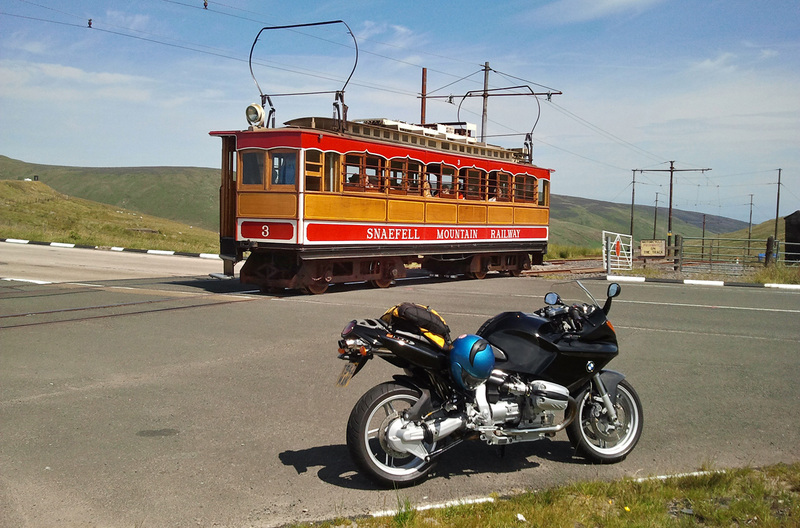 The 17 photographs in 2013 om the Isle of Man were all taken using a Samsung-Galaxy 'S' Mobile Phone Camera with a maximum resolution of 5M pixels.As I was riding my 500cc Honda space was at a premium so thoughts of an EOS/L lens were just not practical. 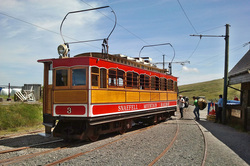 So all in all a fair set of shots given the very basic equipment I had available to me.I was pleased with them anyway! 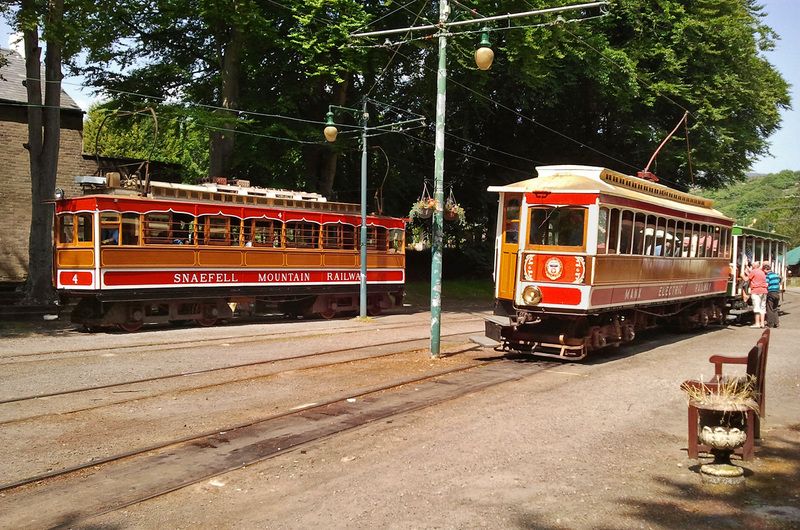 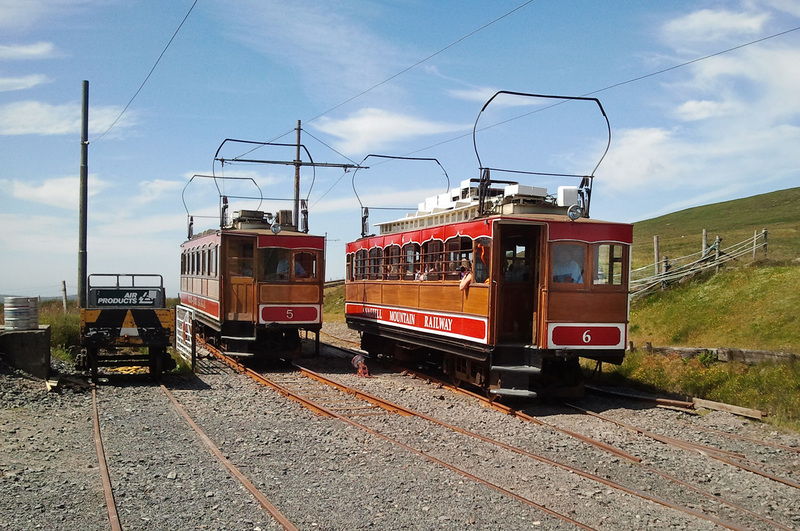 Over a century old Tramcars 5 & 6 pass each other on the commencement of the final section on the Sneafell Mountain Railway from the Bungalow Way Station on up to the Summit.Tram-6 is ascending whilst Tram-5 was coming down. 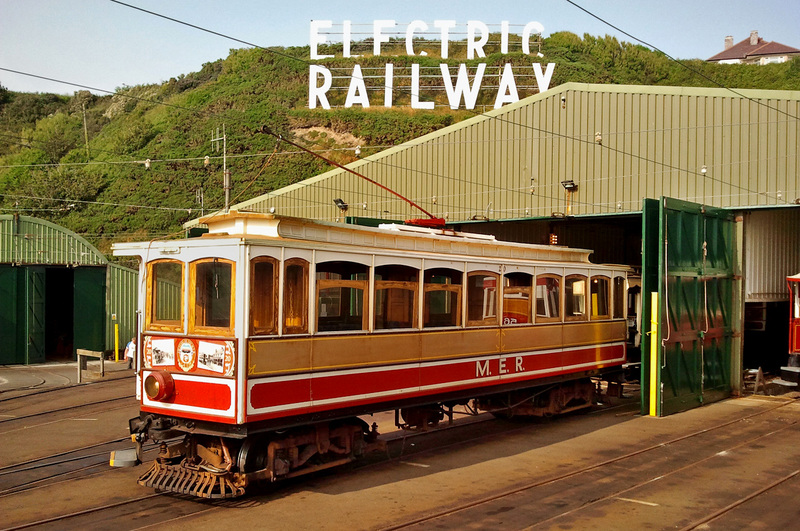 What a time capsule the Isle of Man is.The two Electric Railways,the Horse Trams and the Steam route from Douglas to Port Erin plus the Groudle-Glen line make this place an important location on the World Railway Heritage Map. 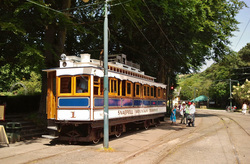 What a Place!!!!!!!!!!!! 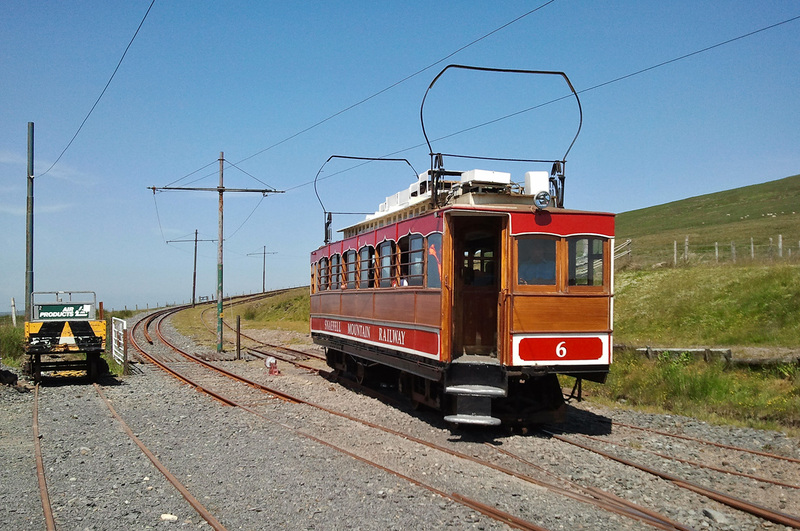 Tramcar Number-5 crosses the Main A18 road at 'The Bungalow' without the aid of any H&S equipment whatsoever.No barriers/No flashing lights/no hi-viz road markings-nothing---and guess what? 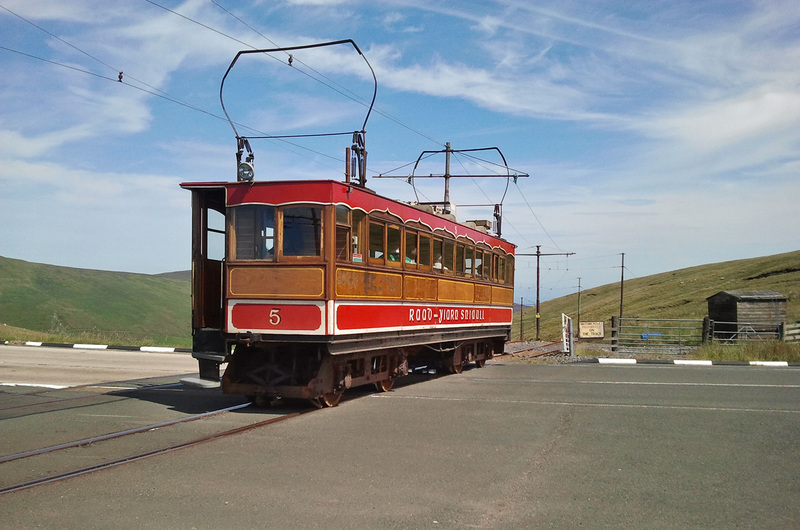 nothing happened, nobody died and no one ever has.What an enlightened place the IoM is.I doubt if the Manx people would be prepared to put up with the sort of crap we in the UK accept on a daily basis,and as for joining the EEC---forget it! 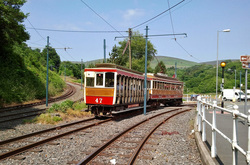 This shot kinda sums up what is so magical about the Isle of Man.Over the years I have now visited this place eleven times,the previous ten times was for the famous TT races.This particular spot 'The Bungalow' is a world famous location on the famous 37 mile TT course.The race bikes actually run at full race speed over the tramlines here.Naturally the trams do not run whilst the races are going on and the whole section is coated with 'shellgrip' to give maximum grip over this tricky section. 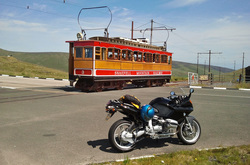 Here is Tram Number-3 and a 1200cc BMW whilst in between is the famous TT circuit. 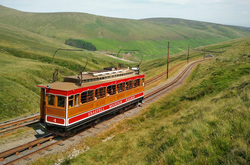 Tramcar Number-4 makes a colourful contrast to the flat-green of the valley that the line was constructed in.The only inhabitants in this area are sheep.At this time only one track was in use on this section up to 'The Bungalow'.From there to the summit both tracks are still in use,indeed trams regularly pass each other on this section. 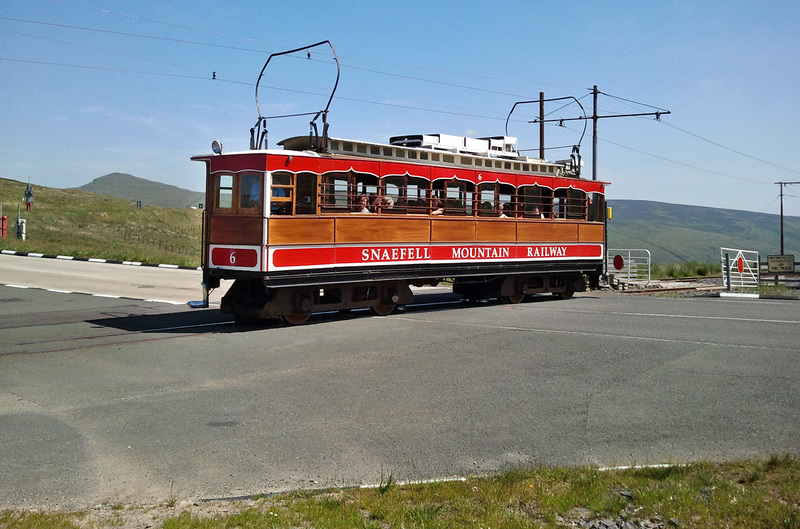 Having dealt with the booked stop at 'The Bungalow' Tramcar Number-3 gets underway on the steep section from here to the summit of Sneafell.Because of the gradient the use of the 'fell-rail' as an aid to additional brakeforce is a definite safety requirement. 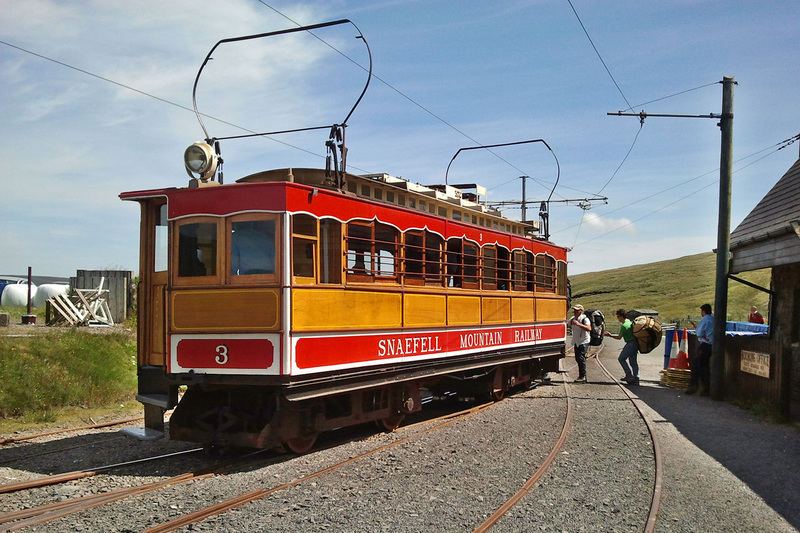 Sneafell Mountain Railway Tramcar number-3 halts briefly at the waystation located at 'The Bungalow'.This is where the railway crosses the world famous Isle of man 'TT' course.The trams were manufactured in 1895,a mere 118 years ago and have run in this livery style now for over a century! 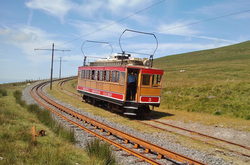 Tramcar Number-3 climbs up through the desolate hills that form the valley the railway follows up from Laxey to 'The Bungalow' where the tracks cross the busy A18 mainroad.Interestingly there are no flashing lights or barriers or yellow hazard boxes.The Trams give a brief whistle on the 'not very load' horn and creep slowly across the road.Imagine that in the H&S parnoid England we all know and love! 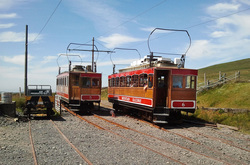 Laxey is the interchange 'junction' for passenger changing from the mainline from Douglas to Ramsey to the Sneafell mountain railway to the summit of the Isle of Man's highest mountain.Here can be seen the two differing types of Tramcars side by side.The SMR Trams still using the original bow type twin current collectors whilst the mainline units now use trolley-poles although these too were originally equipped with the bow type devices. 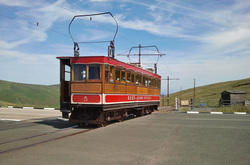 The original 1895 built Tram Number-1 comes off the running shed to take up duties on a Douglas to Ramsey service.What is so refreshing to see here in the Isle of Man is the total lack of palisade fencing anywhere.The whole system runs alongside the main road virtually all the way from Douglas to Ramsey.Common sense seems to have prevailed here on this small island in the Irish Sea.I give the Islanders full credit for having the sense they were born with! 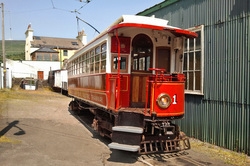 An unidentified Tram stands 'on shed' at Douglas.This is the main depot and workshops where the entire fleet are looked after.Note the 'Hollywood' style letter type hoarding overlooking the shed area.This is visible from miles away.From the pathway that runs along the rear of this huge sign it can be seen that it was once fully illuminated but now all that remains of those fitments are a few corroded junction boxes and some perished wiring! Another Tram restored to the original Prussian Blue/Cream colours as originally applied from the railways opening in 1895 until 1899 ins Number-7.This was restored to passenger duties in 2011 on the MER after many years in use with the Permanant-Way department.No doubt getting rougher and rougher as the years wore on! 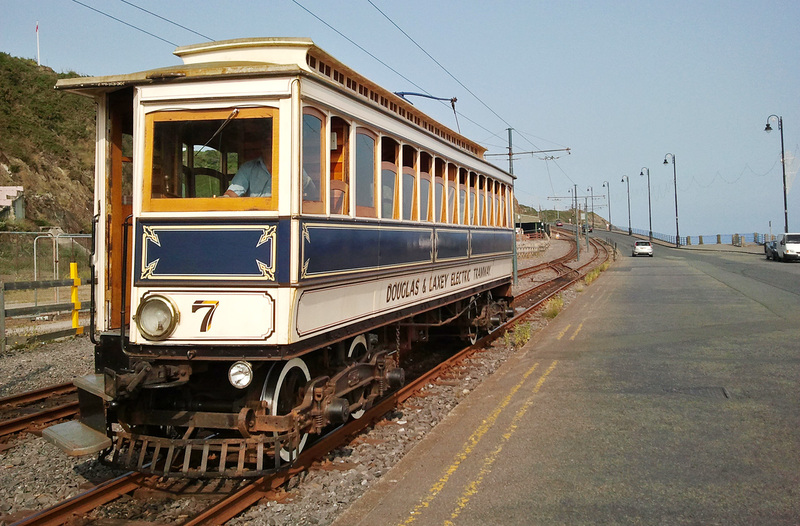 It is seen here near the Douglas terminus on the seafront of that town. 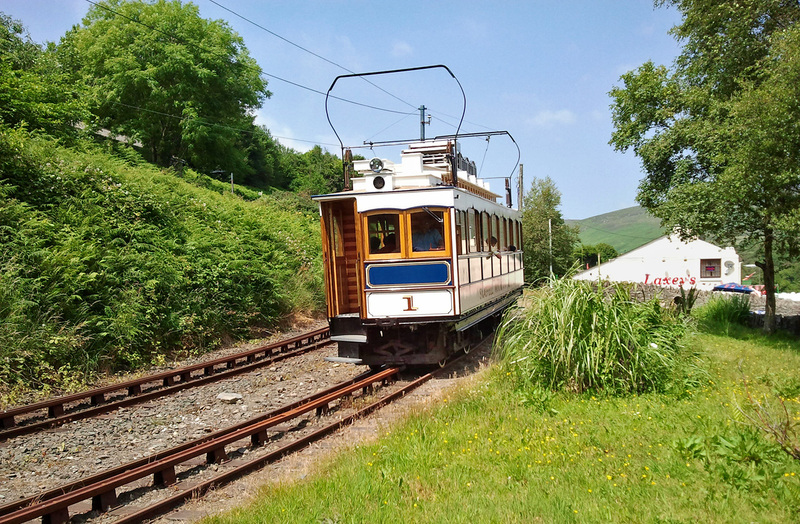 Shortly after the mainline service to Ramsey had departed the Sneafell Mountain service passed as well.This superbly restored 118 year old veteran having no trouble climbing up this steep gradient.It is the original Tram number -1 that was seen earlier in the Laxey Station waiting time. 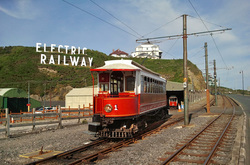 'Illuminated' Tramcar number-9 (note the lighting tubes on its flanks) running with 'Bulkhead' number-47 gets away from the Laxey Station stop and head off onwards towards Ramsey.To the left can be seen the start on the incline on the climb towards Sneafell Mountain for the SMR services. 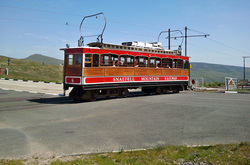 Sneafell Mountain Railway Tramcar number -1 built originally in 1895 was extensively restored in 2011.This included giving it the Prussian-Blue/Cream livery it carried from its introduction up to 1899.Here it is seen at the lower terminus for the line at Laxey.Here the Mountain Railway interconnects with the main line from Douglas to Ramsey. 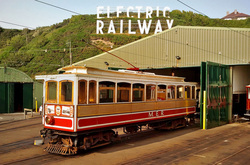 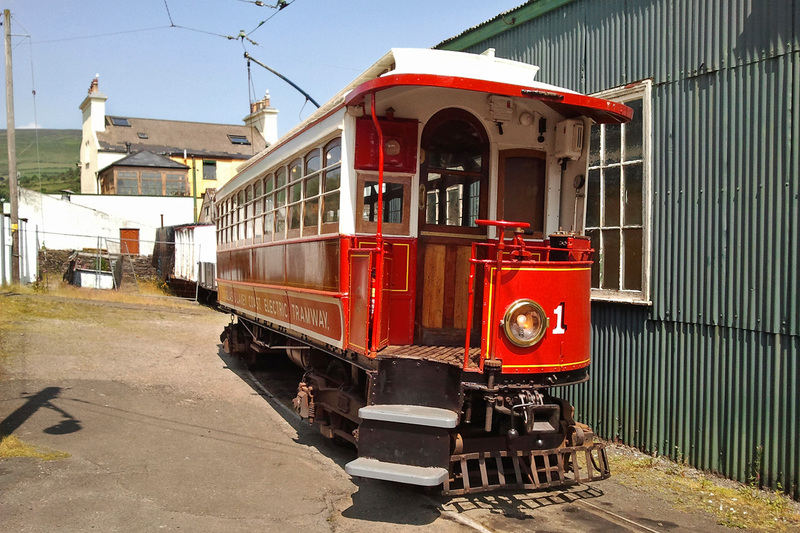 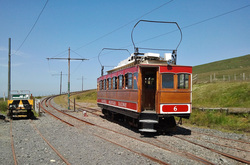 This is the very first tram to run on the Isle of Man 'Manx Electric Railway' Number-1 when it opened in 1893.It holds the distinction of being the oldest tram in the world still operating on its original line.Note power collection is done on the MER using trolley-poles whereas on the Sneafell line bow-collectors are still in use.This vintage unit is seen having just arrived from Ramsey in a refuge siding at Laxey.It was not in public use but later on was to travel onwards to the main depot at Douglas. 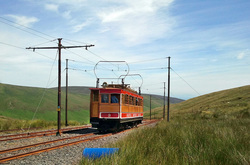 Tram-6 gets away from 'The Bungalow' on the final steep climb up to the summit.Note the 'Fell-Rail' in between the running rails.This is for an additional friction brake to prevent a runaway on this steeply graded line. 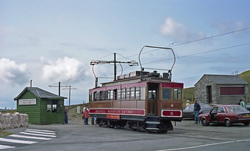 Tram number-6 crosses over the main Ramsey to Douglas road at 'The Bungalow' with another load of tourists heading for the summit of Sneafell Mountain. 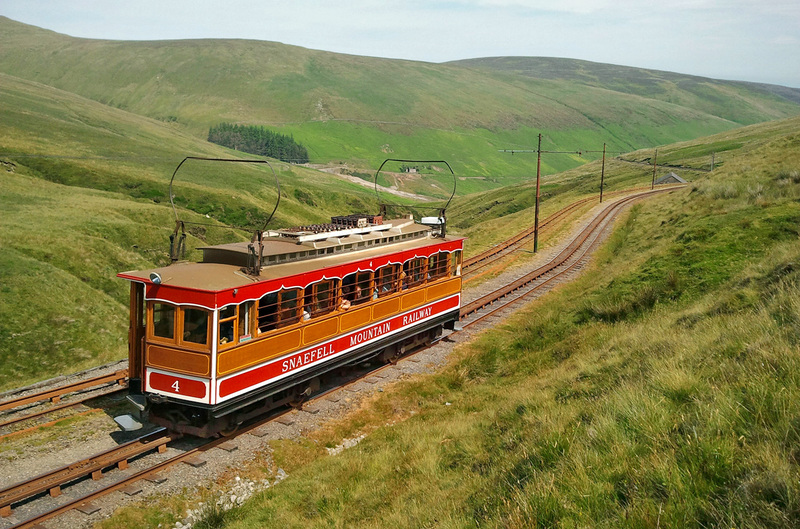 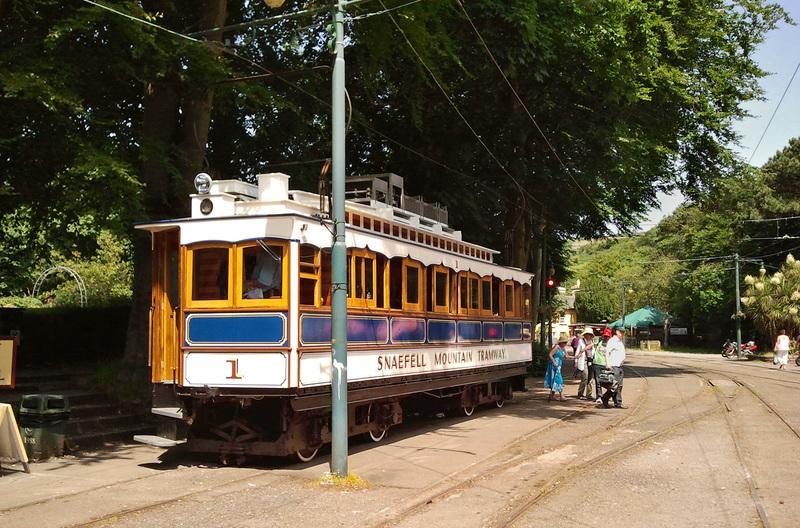 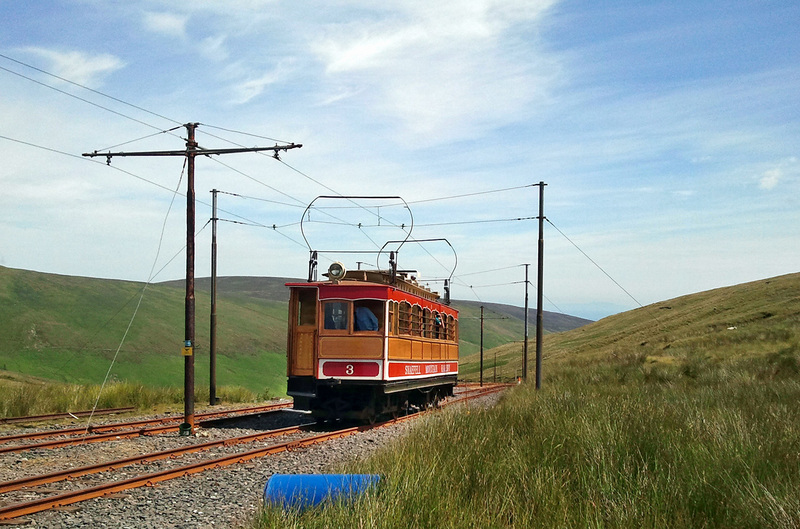 Another Railway on the Isle of Man is the Shaefell Electric Railway from Laxey going to the top of Snaefell Mountain.These ancient wooden single car bogie units are equipped with a central 'fell' rail method of gaining grip for climbing the inclines and also for braking. Here is Car No-6 at the middle station on the line at 'The Bungalow' next to the main A18 Douglas to Ramsey Road.That road is used for the famous TT motorcycle-races.That was my main reason for being on the island!